Wherein Pam ponders the idea that her greatest success at establishing new routines involve slipping them in FIRST thing in the morning…how long can a morning LAST? Happy Saturday, to all my wild and lovely readers! In homage to Havi’s Friday Chickens over on the The Fluent Self — This is the place I review my week – in an attempt to track some things – like progress on my novel and… living intentionally. I shake out my week and lay it out. Let the hard burn off and the good sink in. Call it an experiment in paying attention. Feel free to join in. THIS WEEK’S EXPERIMENT: Turning my focus to this ongoing yearning for yoga time. I planned to try to find my way to the mat at different times throughout the day and see how it felt. THE RESULT: Not AWESOME but not AWFUL either. I managed two yoga/meditation sessions on two consecutive mornings – Mon and Tues. I slipped it in between the SCRIB and my Writing Hours. It fit sweetly and wonderfully – though it pushed the “finish line” time of my mornings by about 1/2 hr. Interesting FACT: I got way more written in the Writing Hours on the days I did the yoga/meditation. There were more words and yet not that feeling of rushing past things. It also felt GREAT physically. Tried to find other times to do it and just… didn’t do it. If I didn’t make it to the mat in the dark time before dawn, I didn’t do it AT ALL. Work on NIP: Full steam ahead and it feels so good to be working STEADY again. Huzzah! Walks: 6 out 7 days. Lovely NECESSARY time. Guitar: Loving it but realize that if I don’t hit the “before preparing dinner” time slot, I just … DON’T do it. Good to know. Yoga/Meditation: 2x more than last week – that’s good right? – PANIC – spilling coffee on the typer machine. Ooooof – felt so stupid and horrified that I had killed her. – TIRED – just so tired this week. I’m not sure why. – Struggling a bit with the word count focus of NaNoWriMo. This really isn’t the way I work. Some days I feel like a fool just PUSHING ahead at such a rapid pace when what I really feel the need to do is sit and stare a bit, have a think, rework another sentence…. But I am forging ahead with this way of working for a few more weeks. Because I am finding such interesting things along the way. Working this way is truly… well… FORCING me to just… follow along… anywhere my characters want to take me, I follow along. And it takes me odd places like.. this week I got to thinking about Women’s Suffrage on the prairies in the early 1900’s and where we get Tyndall Stone. All fun. Have begun exploring the Saskatchewan Archives online. Now there be a BUNNY HOLE!!! This … following along…is like what happened to me this last fall with the 3day Novel Contest with Finnegan Begin Again. I believe there is something for me to discover here. Something to work with – a new type of energy. Not that I will ever LOSE that need to … stare and think… that is my true way of working, but I feel that it is useful to carry on with the experiment that is NaNo-ing. We will see…what we will see, yes? We are half way through the month already. I can do 2 more weeks with this more rushy-pants focus. It ain’t gonna damage me. – Also struggling with The Vein of Gold. Dunno why, but I am resisting it right now. Resisting each task. Ooof. Even thinking about it to write this note makes me want to go lie down. Which makes me think that there is something to be GAINED by diving in and DOING it. Ahh life. S’wonnerful, eh? + Reading Bird by Bird by Anne Lamott. What a great book. She is so hilarious and honest and WISE. I’ve read it all through and now I am going back through it to mine it for nuggets. I also want to find her novels and devour them one by one. + Finding myself referring to the typer machine as a “her” and seeing how important she is to me. This shift is fascinating. I spend so much time online these days, exploring other blogs, chatting on forums, getting to know people. She is so much more than “THE TYPER MACHINE”. I wonder what will come of this realization. + Celebrating the facts that Tippy the Typer is alive and well and SO ARE WE ALL. + also celebrating the fact that this was my 4th week of rising earlier and giving TOP priority to my Writing Hours. Wow. I did it – for a whole month! Yippee! I’m going to renew my contract this weekend. Did I ever tell you about this contract? + Allowing myself to take the rest I need when I am tired. Working on finding the balance – when it is best to get up and MOVE, go for a walk or do a bit of … something… and when it is best to crawl into the bunky with a book or a movie or just to close my eyes for a bit. + Grateful for trips to the second hand store to discover treasures for myself and others. +for the library and for boooooooooks and more books. +for eyes that can see and ears that can hear. +for the TWUC webinar I attended on Friday, learned much and giggled a bit too. +for things like… the otter we watched eating a fish and playing just off the shore today, gorgeous wee beasty! +and for time and space to breath and think and play with things like this blog. NEXT WEEK’S EXPERIMENT: More exploration on the yoga front. ….oh the yearning and the…. Here’s to playing like otters in the water! 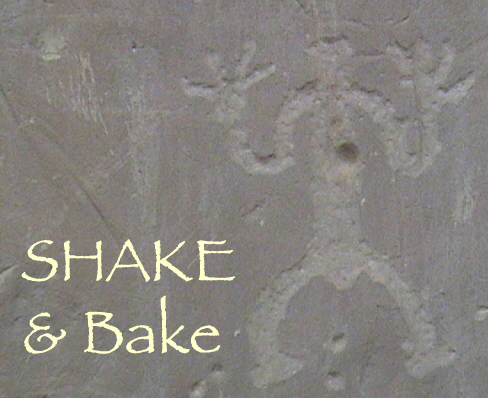 Feel free to share a Shake & Bake of your own. Or let me know what you are experimenting with this week.. I love ‘Bird by Bird’ too. I just started something called “Writing the Mind Alive” and I might try the exercises. They are only 30 minutes long. I just read the Stephen King book you recommend in your reading list. I’m in procrastination mode – reading about writing instead of writing. I love the Stephen King ON WRITING – I’d say it is currently the #1 book I recommend to people. I’ll have to go surfing and check out “Writing the Mind Alive” – I’m not familiar with that one. Let me know how it goes. Have you done “The Artists Way?” It ‘s a gooder. I’m working through “The Vein of Gold” right now but….LAWDY LAWDY I am having a rough go of it for some reason. Ah well – did a TASK from the book today and so… huzzah for me! I really liked the Stephen King book too. I did do “The Artists Way” but a really long time ago. I remember liking it when I followed the practice of it.